Finally, it looks like Idea Cellular has decided to launch their 4G services in Pune city. The two cities of Pune and Nashik were the only 2 places where Idea Cellular did not have 4G services enabled. Incidentally, they are also the cities, where Idea Cellular has maximum voice and data subscriber base. While Idea Cellular has not announced this officially – the Idea stores in Pune are now distributing Free upgrade to 4G SIMs. Visit any Idea Cellular store along with your existing working 3G SIM card. You will need to give you mobile number to the store employee, who will then issue you the new 4G SIM card packet. From your existing Idea SIM, you need to send a message with 19 digit code of new 4G SIM card to 12345 short code. Here is a screenshot of the same. In a few minutes you will get a confirmation message that your request will be processed shortly. In a few minutes, your old Idea SIM card will get deactivated and new 4G SIM card will be activated. As a confirmation, a SMS and an email is sent to your registered ID. 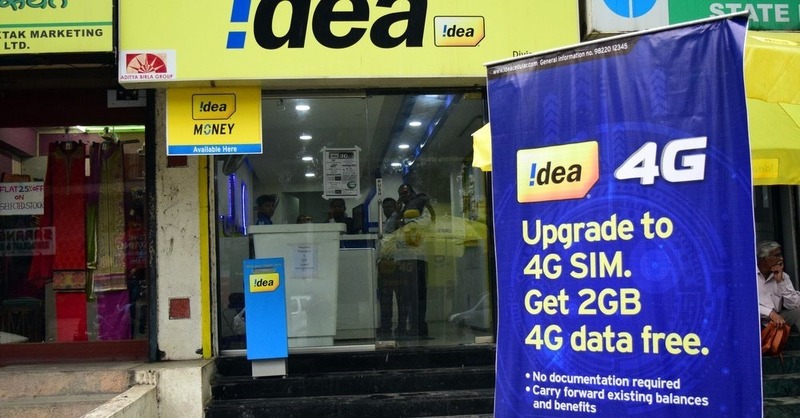 As a introductory offer, Idea Cellular is offering 4G speed at existing 3G rates. In addition, they are offering 1GB free data usage for 5 days to test their speeds. 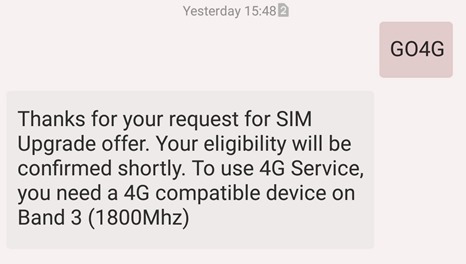 However, to activate this, you will need to send GO4G to 12345. So, if you are in Pune and have been waiting for Idea’s launch of 4G, head straight to your nearest Idea store and get your SIM upgraded to 4G. 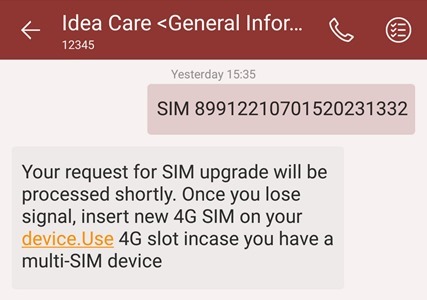 Disclaimer: We upgraded our Idea SIM, but we were still unable to get 4G signals – the phone still connected to IDEA 3G. However, as per the Idea store manager, 4G should start at any time. We will keep you posted as soon as 4G starts. Jio, Airtel and Vodafone have already started their e-KYC for new connections in various cities across country. Now, Idea Cellular has also joined the pack. They are rolling out of e-KYC based activations for prepaid and postpaid customers. The service is available across 22 circles in India. This system allows user to avail instant verification using their ‘Aadhaar’ number that enables quicker SIM activation. The company says that the facility for enabling biometric verification of customers is being rolled out in exclusive Idea stores and will be extended to multi-branded prepaid outlets in a phased manner. "Idea Cellular Starts Offering Free 4G SIM Upgrade in Pune; e-KYC Launched", 5 out of 5 based on 1 ratings. LeEco Launches Le Pro 3 With 6GB RAM, Snapdragon 821 SOC & 4070 mAh Battery! Best Data Plans Under Rs 299 From Jio, Airtel, Vodafone, Idea & BSNL! Reliance Jio Becomes The Third-Largest Telecom Operator In India! Reliance Jio Planning 5G Network; Data Costs Down By 90 Percent! Rs 499 Plans Compared – Which Is The Best Value-For-Money Plan? Jio Fails To Stop Airtel, Vodafone & BSNL From Clinching Market Share!